Special Counsel Robert Mueller filed his memo responding to Flynn at the Friday afternoon deadline and it confirmed General Flynn was set up. Mueller did not release the original 302 report on Flynn which was taken by Special Agent Joe Pientka and Peter Strzok in January of 2017. Instead, Mueller cited a 302 interview with Peter Strzok taken on July 19, 2017 about the ambush interview he had with General Flynn earlier that year. 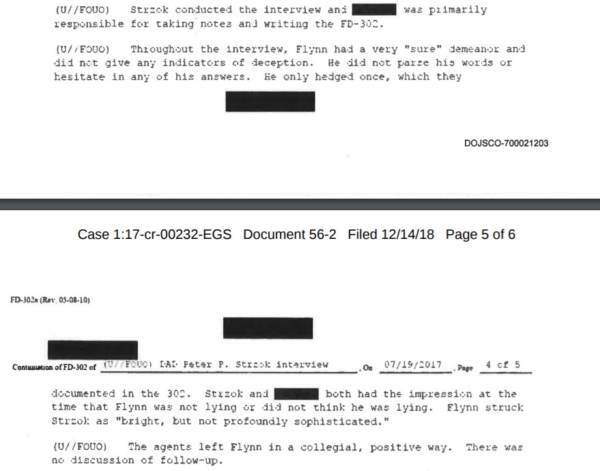 Mueller redacted the name of the other FBI agent who was with Strzok interviewing Flynn — but we know it’s Joe Pientka. The missing original 302 report on Flynn immediately raised red flags — but an interesting footnote in Mueller’s filing is raising even more questions. Why did FBI agents interview Strzok?? He was fired just a few days later, but the interview was not about his conduct. The document is heavily redacted. Here is the 8/22/2017 FD-302. Peter Strzok was fired by Mueller just a few days after the FBI interviewed him in late July. Other questions…does an ORIGINAL Flynn 302 even exist? Was the original 302 altered, edited, re-written, destroyed or never even prepared in a timely manner? General Flynn and the American people deserve answers. WHERE IS THE ORIGINAL 302 REPORT ON FLYNN?